A few years ago, an outside consultant was analyzing the Gloversville sports program and questioned the fact that Gloversville High School sports teams have more than one mascot. “Are you Huskies or are you Dragons?” was the question, and “one must go” was the suggested fix. The dual mascots were also questioned back in the late 1980s, when a high-ranking district employee also had the notion of removing one of the school’s mascots. In talking to Gloversville High School varsity basketball coach Aric Kucel, there is truth to the uniqueness of Gloversville having two mascots, but they are not the only school. He believes there is one other High School in New York, as well as college program Long Beach State in California, who stands behind “Dirtbags” for their baseball program, and “49ers” for all their other athletic teams. While it is a mystery as to how those schools came to have two different mascots, to understand the reasoning behind why Gloversville has two, one must first learn about a man named John “Jack” Kobuskie. A Bob Luey cartoon that ran in The Leader-Herald in 1968. From the 1930s through 1981, Jack Kobuskie was synonymous with Gloversville sports as a player, coach and mentor. Kobuskie was born in 1923 in Bleecker, where his family worked as loggers. He was the youngest of eight children and during his mother’s pregnancy with him, his Father was injured in a logging accident, leaving him unable to work. Shortly after his birth, the family uprooted from Bleecker and moved to Gloversville so his mother could pursue work in the glove industry. 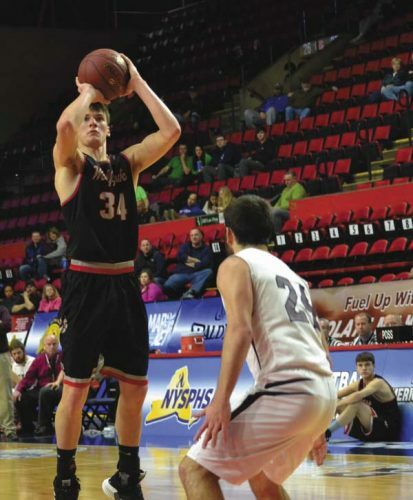 Kobuskie would go on to attend Gloversville Schools (McKinley, Columbia, Estee Junior High School and Gloversville High School) and fell in love with the sports of basketball and baseball. As most young boys of that era, he was also known for “pitching pennies at the line” against neighborhood kids. He used earnings from that activity to purchase basketball court time at the Italian Alba-Nova club in Gloversville (63 Bleecker St.-the area now covered by the Peking Chinese Restaurant on corner of Bleecker and Church streets) to hone his basketball skills. He would also be introduced to the game of golf at the age of 13 when he began caddying and playing at the Kingsboro Golf Course that was a short walk from his home at 21 Maple Ave. on the north end of Gloversville. By the time he graduated from Gloversville High School in 1942, he had become one of the region’s best players in golf, basketball and baseball. In the fall of 1942, he enrolled at Syracuse University to pursue a degree in business administration. After one semester, he left college to enlist in the Army. He joined the ski specialist division at Camp Hale in Colorado to prepare for the invasion of Western Europe. After a year with the unit, he was discharged from the Army and returned to Gloversville in 1943. In 1944, he would sign to play professional baseball with the Detroit Tigers organization. He and fellow Gloversville native Jack Holmes played for the Jamestown Falcons of the Pennsylvania-Ontario-New York League (PONY League). After one season of minor league baseball, he opted to leave the sport to return to college. In 1945, he enrolled at Cortland State Teachers College to pursue a degree in physical education. At Cortland, he immediately joined the basketball team and became their star player and captain as a four-year varsity player. During the 1946-47 season, he set the then Cortland Red Dragons single season scoring record with 326 points. He also played on their baseball team in the spring and the golf team in the fall becoming their No. 3 man. He graduated from Cortland in the spring of 1948 with a degree in physical education and took his first teaching job with Dolgeville High School and was named their varsity basketball coach. During the 1948-49 season, he not only guided the Blue Devils to a respectable 12-6 record, he did so while also playing professional basketball for the Saratoga Indians of the New York State Pro Basketball League. When the Gloversville High School varsity basketball coaching position became available in the fall of 1949, Kobuskie returned to Gloversville to teach Elementary Education. He also opted to quit professional basketball to take the Gloversville coaching position and to focus on developing the basketball program that he grew up in. They won the Western Conference that first year (1949-50), finishing ahead of defending conference champion Saratoga High School. This was just the start of a long and celebrated coaching and teaching career in Gloversville that would last 31 years. During that time, he would teach at both Boulevard and Park Terrace Schools, eventually becoming the physical education curriculum coordinator. In addition to coaching varsity basketball, he also coached varsity golf and soccer and assisted Duke Miller in both football and baseball. In basketball, he would lead his teams to many Western Conference and Foothills Council League titles. He also guided his teams to two NYS Regional Tournament appearances and one trip to the NYS Tournament. In total, Kobuskie would amass 398 wins (to 215 losses) at the varsity basketball level. In 1981, just two wins shy of 400-wins, he retired from coaching to care for his of wife of 52 years (Irene), who was in poor health. During those years, he also earned several berths to compete in the New York State Amateur Tournament and was offered an administrative position with the PGA Tour. So, what does any of this man’s accomplishments have to do with Gloversville having two sports mascots? This was also a play on the same nickname of some of the early Syracuse University teams carried. Those were some of the same teams that Kobuskie and Gloversville’s Hal Sutliff took on in exhibition games when they both played for Cortland State. Kobuskie also liked that this name allowed his teams to move away from being the traditional “Gloversville Huskies” that football, baseball and all other programs went by. While this name caught on, it continued to carry the surname of Gloversville’s tell-tale “Huskies” and the team began being called the “Huskey Reindeer Five,” as well as “Kobuskie’s Cagers” for the next few seasons. With the blessing of Gloversville High School Principal Arthur Ferguson, the name change was allowed and the team then went on to win six out of their next seven games. The losing streak was over and from that moment on, the Red Dragons name stuck. 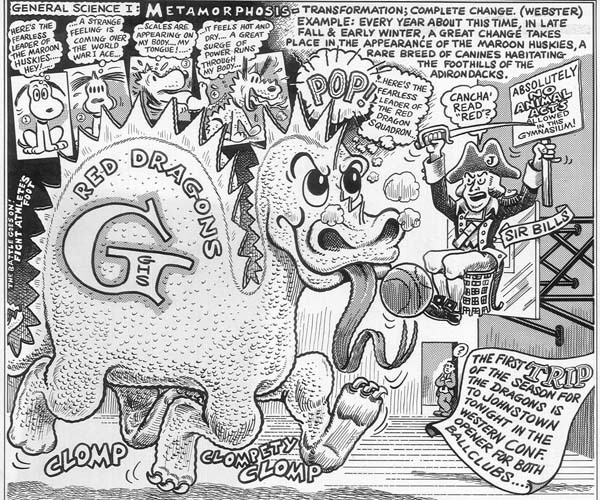 When Kobuskie took over the newly formed GHS boys soccer team during its second season in 1970, he felt that program also needed to have its own identity and naturally brought the “Dragons” mascot over to that program as well. Sixty years later, the “Dragon” still lives on in Gloversville, comfortably placed as the foundation of the basketball, soccer and swim programs (the swim team carries “Sea Dragons” as their mascot). The fact that the dual mascots have lasted the test of time is not just a silly tradition, but rather a tribute to the man who brought it here. It is a tribute to the man who walked away from professional basketball to give back to the program that he grew up with. It is a tribute to the man who walked away from coaching just two wins shy of the magical 400-win coaching milestone to care for his sick wife. It is a tribute to the man who passed up a lucrative offer from PGA to remain in his hometown to continue mentoring and coaching over 3,000 students and athletes during his 31 years with the Gloversville Enlarged School District. Coach Kobuskie passed away in 2011 at the age of 87. He was inducted into the Cortland University C-Club Hall of Fame in 1974 and the Gloversville Enlarged School District Hall of Fame in 2005. The basketball worlds original “Coach K” is memorialized at his life-long alma mater with a banner that hangs in the rafters in the Gloversville High School Gymnasium denoting his 398 coaching wins, as well as a bronze plaque celebrating his life and career that hangs at the gymnasium’s entrance. Shortly after his passing in 2011, a group of his former players created the “Jack Kobuskie Memorial Scholarship” that honors the GHS varsity basketball player each year that personifies the same great character attributes as Coach Kobuskie did. 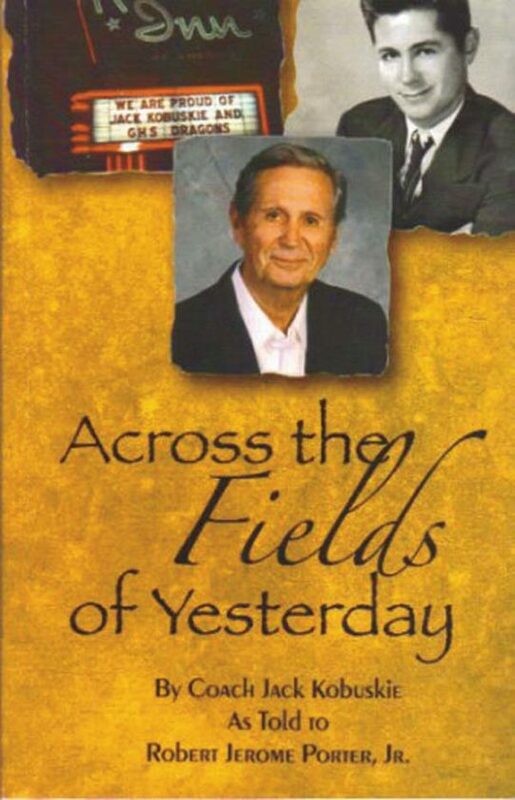 His life and career has been chronicled by his former player Robert Porter Jr. in the book “Across the Fields of Yesterday” that was published in 2005. Copies of the book are available for a $5 donation to the GHS Hoop Club. Former GHS coach Don Landrio has the books available at all GHS boys basketball home games. They also are available or by approaching any member of the Gloversville Hoop Club.